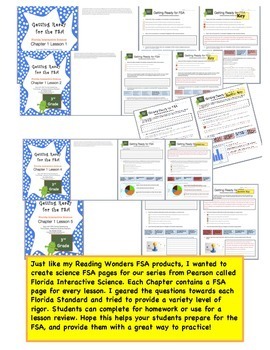 Just like my Reading Wonders FSA products, I wanted to create science FSA pages for our series from Pearson called Florida Interactive Science. Each chapter contains a FSA page for every lesson. I geared the questions towards each Florida Standard and tried to provide a variety level of rigor. Students can complete for homework or use for a lesson review. Hope this helps your students prepare for the FSA, and provide them with a great way to practice! Skills this chapter: questions scientists raise, observations and tools, science safety, records and communication, data, inferring in science, and scientific models.